Home > Law Books > Practitioner Treatises > Georgia Law of Torts, 2018-2019 ed. 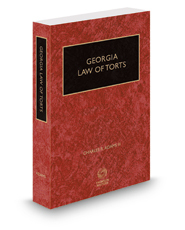 Georgia Law of Torts, 2018-2019 ed. This title is a comprehensive treatise on substantive Georgia tort law. The first publication of its kind, it is intended both for the general practitioner who necessarily encounters a broad range of torts issues, as well as for the specialist who needs a basic familiarity with an area of tort law tangential to his field of expertise. The seasoned torts practitioner may also find this book to be a helpful ready reference work for location of pertinent statutory or case authority.